Today's CPAN experiment was 15 minutes with Chart::Clicker. I'd heard great things about this distribution before, but had never tried it. I've been working lately on financial analysis of publicly traded companies. In particular, I've been analyzing trends in the growth of owner earnings, given a ten year window of SEC reports. (Don't worry if you don't know everything that means yet.) The goal of this work is to find a trendline which smooths out yearly ups and downs and gives a good idea of the company's expected growth. My statistics are a bit rusty, so I wanted to see the resulting information before I trusted my calculations. My first instinct was to copy and paste information into a spreadsheet and create a graph there. Yes, I did that manually a couple of times. Then I remembered I have the full power of Perl available. My analysis code produces a list of values for free cash flow in thousands of dollars over a ten year range. It also uses the least square fit technique to plot a line representing the change in those values. That line should show the trend in values with as much accuracy as possible. While I have ten points for the free cash flow line, I need only two points for the trend line, because it's a straight line. A chart contains one or more datasets, and a dataset contains one or more series. Each series corresponds to a line. Populating a series is easy, given arrays of data; keys represents the X axis and values represents the Y axis. Most of the rest of my code customizes the display of the data. I haven't found the right way to display the X axis yet, so I've elided that for now. I also had to customize the underlying graph lines, as mentioned before. That customization was the only tricky part of using Chart::Clicker, and that only because it took a few minutes to figure out how to do it. Figure 1. 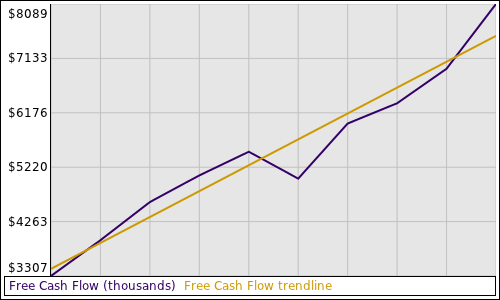 Free Cash Flow and Trendline for NYSE:KO. I'm not often wholly impressed by Perl and the CPAN anymore; I expect things to work. I didn't expect things to work as easily as they did today. The whole experiment demonstrates the best the CPAN has to offer. This page contains a single entry by chromatic published on February 10, 2012 3:44 PM. Templating with Widgets, Not Primitives was the previous entry in this blog. The Values and Costs of Automation is the next entry in this blog.